All versions of Android from jelly Bean and up natively support hundreds of emojis, including all of the standard emojis in the Unicode emoji standard. Older versions of Android featured simple, black-and-white emoji that often featured Android's little robotic mascot. However, current versions of android have been switched over to the new "Hangouts" emoji set, which features familiar yellow smilies and is shared across other Google properties like Google+. For examples of the old and new versions of the same Android emoji, see the example below (this emoji is named "Smiling Face With Open Mouth And Tightly-closed Eyes"). The default Android Keyboard has support for emojis - if you have a Samsung or HTC device that doesn't have the default keyboard pre-installed, just grab the Google Keyboard from the Google Play store. 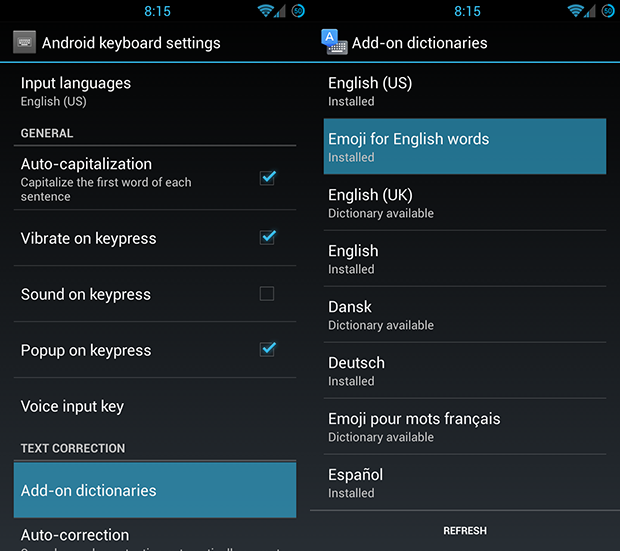 To enable emoji shortcuts, go to Settings > Language and Input > Android Keyboard (may also be called Google Keyboard) and click on the settings button next to the keyboard. Now, scroll down to "Add-on Dictionaries" and tick the list for "Emoji for English Words" (try refreshing if it doesn't show up immediately). Install it and refresh the page to ensure it is now shown as Installed. With the Emoji keyboard add-on enabled, whenever you type a keyword that has an emoji associated with it (like "airplane" (✈) or "smile" () the associated emoji will be inserted into your message. This works on all apps including Messenger, Twitter, Google+, etc. The full list of emojis supported by Android can be seen below. If you want to copy any of these emojis on your mobile device, go to the master emoji list to copy and paste native emojis in your browser.